This is a long description, but it was hard not to want to write all about our experience. If you are interested please read on, if not just scan the pictures above to get a sense of our trip to China. How can I start to describe the week that we just spent in China? If I can portray even a portion of the intensity of the experience, you'll be touched in your spirit as we were. 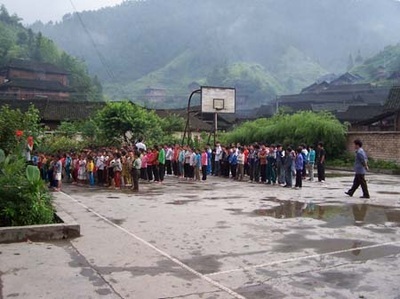 The background is that our school has a relation with a school in a remote village in southern China through an organization called the Zigen Foundation. 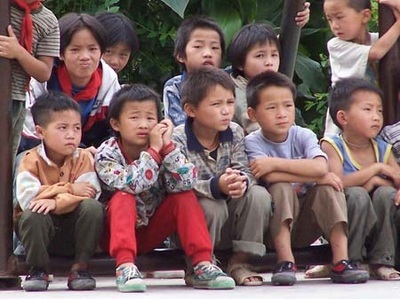 The trip is designed to benefit children of both cultures and promote understanding between East and West. Let me set the scene - there are 15 of us - 4 teachers, 4 parents and 7 children aging from 4 - 9 years old. We leave the Hong Kong airport burdened with 16 boxes of supplies (paper, pencils, slates, chalk...) which have been purchased by the school children in a fundraising function, plus luggage, cameras, and 3 laptop computers. We arrive in the city of Guiyang and our Chinese speaking sponsors meet us as arranged, but our directions for the hotel are not correct and we spend an hour with minimal language communication trying to sort things out. This is our first indication that everything in China is slow and takes much discussion. We finally arrive at the hotel, everything is fine and we leave the next morning for the village of Mao Ping. As we arrive, the entire village is waiting - some children are playing drums, there are 4 men with huge (15 foot tall) bamboo flute-like musical instruments playing a traditional song, some young women are dressed up in traditional costume to perform a welcome dance for us, and the rest of the villagers are lining the path. Smiles and curious stares abound. We pass through the lines with the obligatory sips of rice wine (yikes! pure alcohol) from a buffalo horn as they welcome us.We were pre warned not to touch the horn - if you do, you have to drink the whole thing! 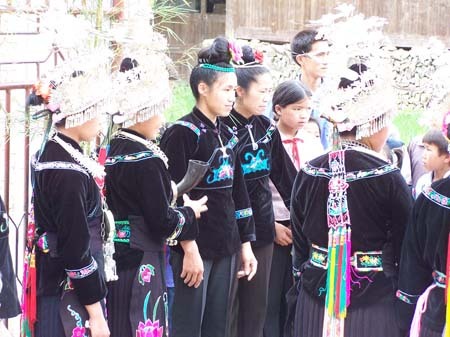 The procession continues to the courtyard of the school house which is the main gathering place in the village where the welcomes and dances continue. The formal welcome is over and now our gifts of basketballs, soccer balls, and hoola-hoops enable our kids and their kids to play without the need of a common spoken language - just the language of kids and play. 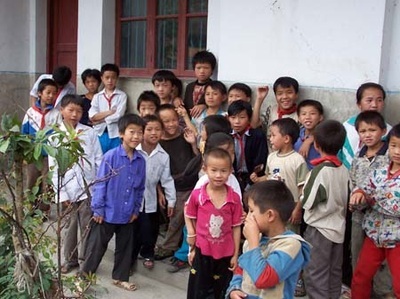 Again, there is a lengthy discussion about where people will stay for each night and a pairing up of a child partner for each of the kids in our group.Each family is eventually assigned a host family and our new friends accompany us to their homes. This is an agricultural village - rice,vegies - where everything is done by hand. 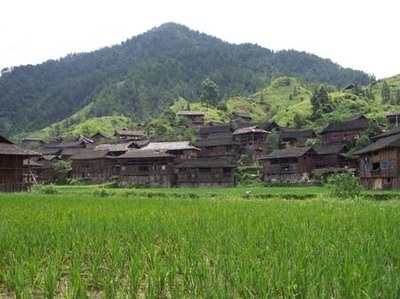 Wooden houses dot the hillsides - the houses are built so that the animals (pigs, water buffalo) inhabit the ground floor and the living quarters are above. There is no inside running water and outhouses are used for bathroom needs. A fire pit is used for cooking, but there is electricity and wouldn't you know it - some televisions. The diet is quite healthy with lots of vegetables, rice, eggs and a bit of meat. 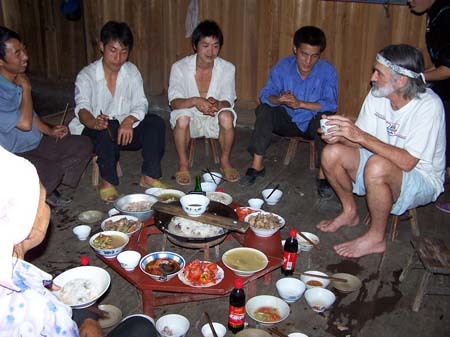 Billy, Sandra and I stayed at the school principal's house which had rough wood walls and floor, some glass windows, 2 living levels, 1 room that was full of potatoes, one room full of rice, a couple of bedrooms, winter kitchen, living room, and a beautiful open-air sitting room. At night the only noise was the nearby stream and when the few lights were out, it was very dark. Beds were raised wooden platforms on which were blankets and pillow. Furniture was a few wood small tables and a couple of falling apart couches and chairs.This home had a few old posters and calendars hung up, while many homes use newspaper on the walls like wallpaper because it lightens up the rooms by covering the dark wood. A swallows nest is in the living room with swallows free to fly in and out of the open window and is considered good luck. 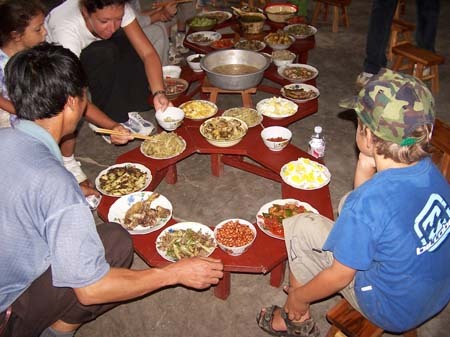 Dining tables are non-existent as all food is eaten family style where large bowls of food are placed on a low ring, everyone has their own individual bowl and chopsticks, and just takes from the community bowls while sitting on TINY stools. At our first dinner with our host family were Billy, Sandra, Ann and about a dozen members of the local family and luckily a translator from the Zigen foundation. 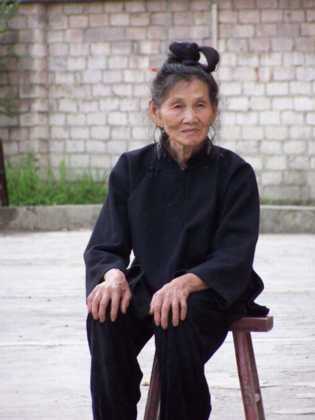 It was great - the local dialect was spoken, one lady was able to translate that into Mandarin and then the Zigen person could translate the Mandarin into English so it was a real life game of round robin telephone. They killed 2 chickens for our dinner (very big deal as animals are usually only killed for Chinese New Year) and had made a chicken stew along with many other local dishes - dinner took about 3 hours to cook as they had to do everything from kill the chickens to make all the dishes - on one cook fire. 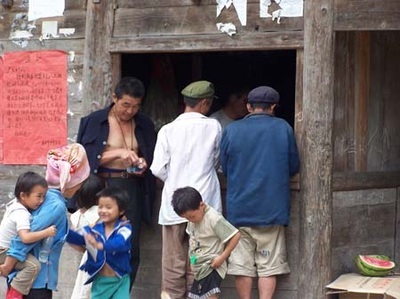 Rice wine seems to accompany all festivities as well as some local beer and when I refused a refill I was told that in this village if you drink once, you have to drink twice! Women are up about 4:30 am to go out and gather greens for the pigs and some for people, then back to cook breakfast while both men and women work the fields. All work in the fields is done by hand with an occasional water buffalo to assist. Because this village has access to a town (about 2 hours by vehicle) there are some store bought commodities, but they are few and far between. Everywhere we go the children group around us, smiling, always curious to see what will happen next and the adults wave and smile as we go by - we wonder what they say to each other as we pass??? 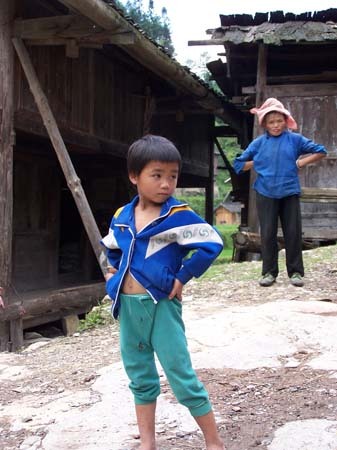 The children enjoy the digital cameras as we take their photos and show them the results they giggle and giggle. The Zigen foundation has built a 'Women's Center' in the village to provide a place for women to gather and to provide education in areas of health, economics and more. One of the primary questions of the village is how to make money. They are fairly self-sufficient as they are able to grow and raise most of their own food, but there is always the need for other things such as window glass or hardware or clothing and so on. The principal's wife has been teaching some of the other women in the village to sew and embroider as a way to market products and make money. They had an exhibition and sale for us and our group purchased many of their wares. Billy and I were fortunate to purchase an incredibly beautiful skirt - started 3 years ago - which we plan to use as a wall hanging. The cost of the skirt was equal to the profit from one pig, so if the sewing takes off some of the women may be able to put more time into the sewing and less into taking care of pigs. All children here attend primary school - there is a fee of about $25 USD and the Zigen foundation makes sure that all children who can't afford the fee are sponsored. 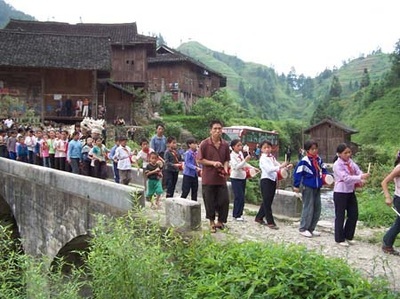 There is a middle school in another village or in the nearest town but attendance necessitates living at the school as it is much too far to do a daily commute. Mostly boys attend the middle school as families who have to choose between a son or daughter attending will always choose the son. Again the Zigen foundation sponsors some girls for attendance at the middle school and also the senior high in the town. The school is a rough cement building built by the government with desks and stools for the children. Each desk had a set of very old used books for each child and instruction is very traditional. Some bits of technology are already sneaking in - there was a distance learning room with a tv, dvd player and satellite hookup. It seems so incongruous to see technology is such a primitive setting. 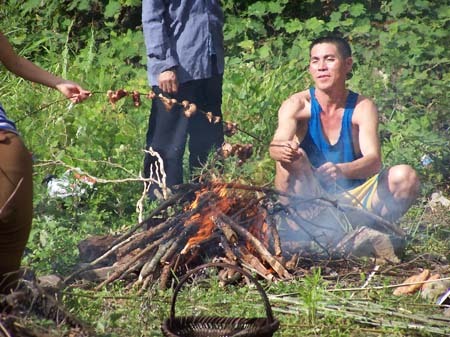 The village hosted the best barbeque that we have ever been to. 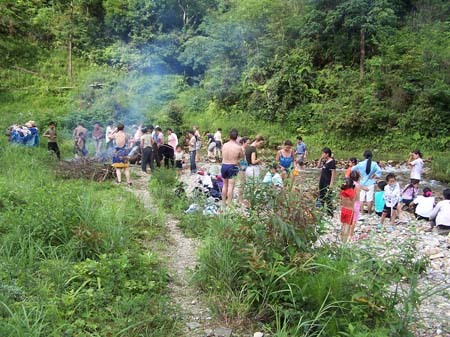 We hiked to the river where we swam while the villagers prepared a wood fire, washed the pork meat in the stream, cut it off the bones, and stripped bamboo to make skewers. Yams and potatoes roasted in the coals while the pork cooked on the fire. Rice always accompanies everything as well as chili sauce. There was not a paper plate or utensil to be seen - just great food, lots of smiles, kids and adults swimming and having fun. There was a simple PA system to host an evening performance at which the villagers performed traditional villages and songs around a huge bonfire. Our group did a short play, sang some songs and the villagers laughed and laughed at us doing the Macarena. On Monday we had lessons scheduled for the local children with an art/math focus. Billy and I had the children use the drawing tools on the computer and build a clay animation movie. Although none of the children had ever touched a computer some of took to the mouse quite readily. More surprising was that none of the children had ever used clay before. The other teachers did various art/math activities with the children. All of the activities were a success to some degree and the local teachers got to see some alternative ways of instructing students. Even the fact of having desks out of straight rows and children working together were novel concepts. 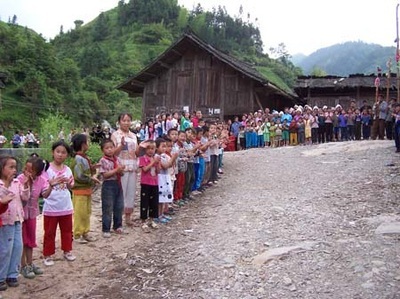 As we leave, the whole village again gathers to see us off and tears are in the eyes of many of the villagers and ourselves as well. In our minds the questions are many as we leave - how can the village continue to survive? If you open up the doors will the young people want to return to the village? What will happen if tourists come to the village? Should the village be preserved? Is modernization always a good thing? Photo Gallery: click for larger image. 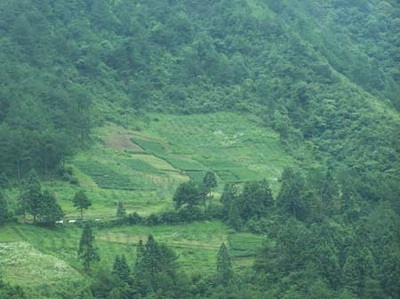 Typical countryside - very green, terraced rice paddies, mountainous. 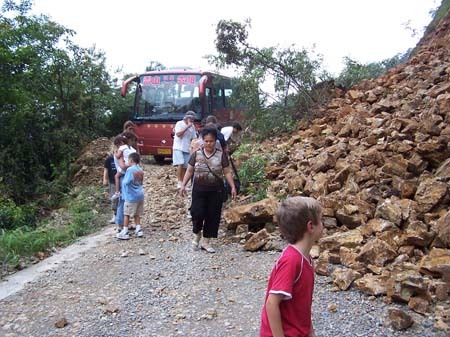 A small landslide blocks the path of the bus so everyone hauls rocks out of the way and the bus is able to pass. The village is gathered waiting our arrival. 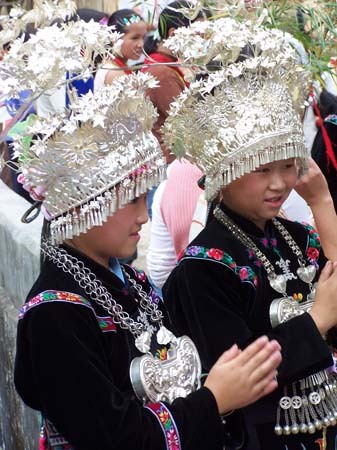 Traditional Miao headdress and costume. 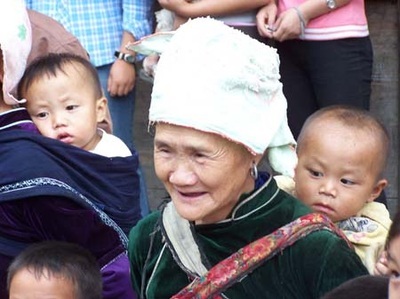 All generations were present to watch the festivities. 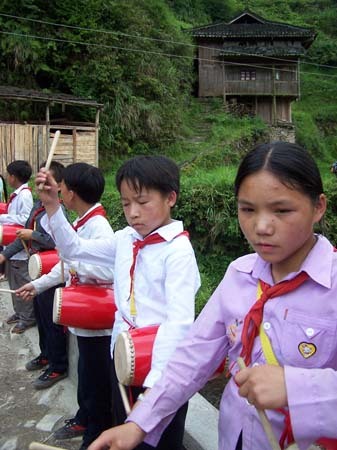 Young drummers line the path as part of the welcome ceremony. The procession winds its way across the bridge, down the lane and into the school yard. Here is the horn that everyone sips from as they enter the village. 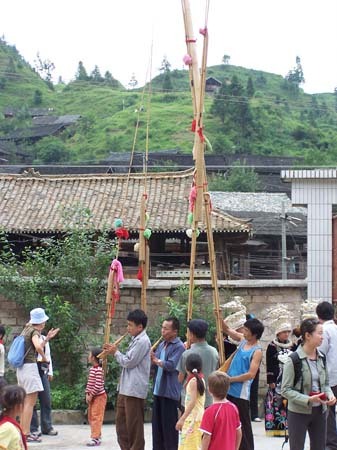 Here are the huge bamboo flutes - hard to balance, hold and play all at the same time. 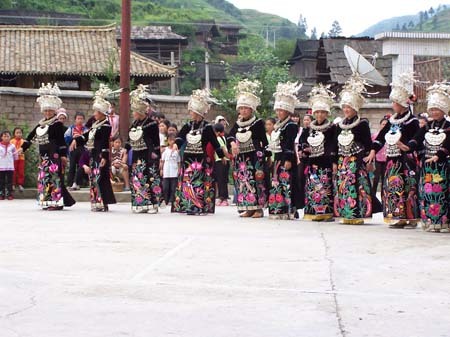 Mao Ping dancers performing the traditional welcome dance. They look to be all young girls in their teens. 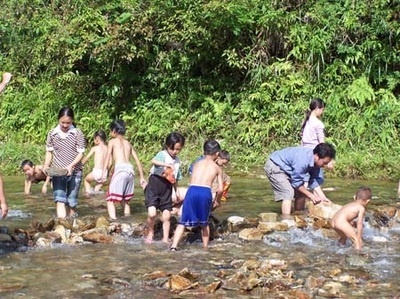 The children were a bit timid at first but warmed up very quickly. Just a shot of a couple of the local girls. Dinner our first night in the village - chicken stew, tomatoes with sugar, other assorted dished and of course rice wine. Stream running through the village. Coordinating the teaching activities with the local staff. Here is a closeup of a rice paddy. 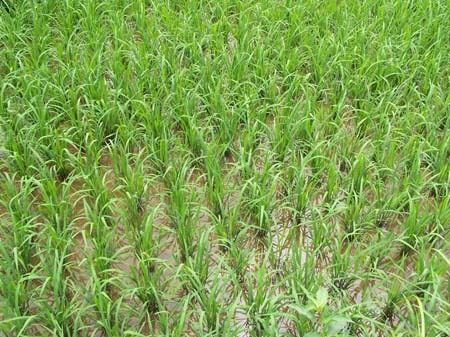 They grow fish in the rice paddies - how smart! 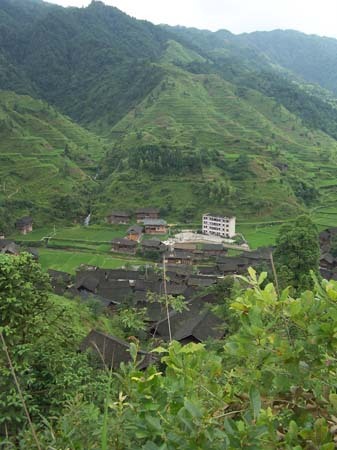 Here is the view of the village from one of the hillsides. You can see the school - the only concrete building and the center of activity. 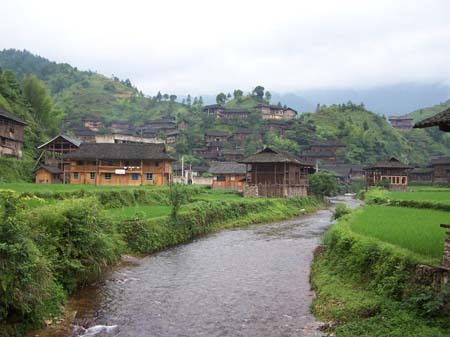 Picture of the village across one of the numerous rice paddies. This was a potluch lunch for our group - vegetables, eggs, potatoes, peanuts - all in many varieties of dishes. Here is the skirt that is worth one pig. It was started 3 years ago by 2 ladies in the village. They were very happy to have made a sale. 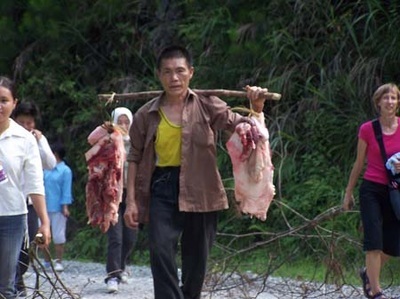 Here comes the meat for the barbeque. Everyone else is dragging wood for the fire. Every stream needs a dam to make the swimming hole larger. 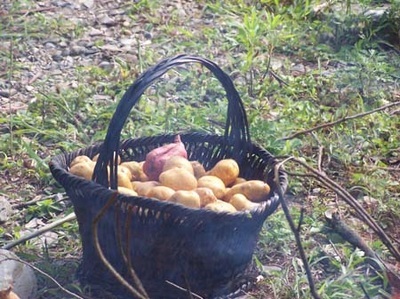 The potatoes cooked in the hot coals - both yams and regular potatoes. Language is not a barrier when there is food, swimming and kids. They cleaned and cut the meat off the bone, then put it in some kind of chili sauce then cooked on bamboo skewers - delicious. Each morning the children line up for the days instructions. 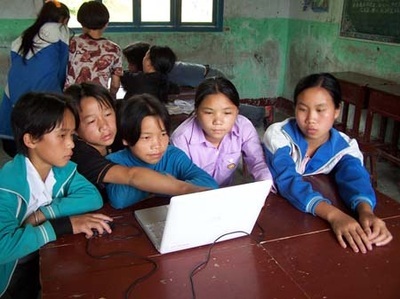 DESCRIPTION: The children had never touched a computer or a mouse before. Some got the hang of using the mouse quite easily. We were fortunate to catch these 2 in such a similar position. Here is the local convenience store with a few commodities to sell. 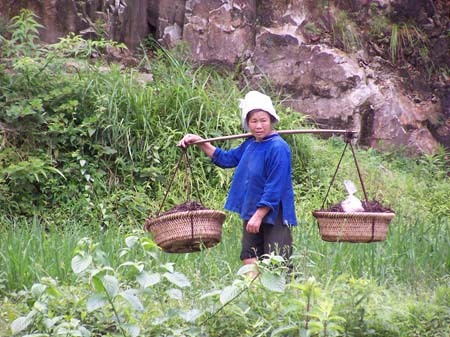 This is the most common way of carrying goods in China. One tiny, old woman had a pole like this with 2 huge bundles of greens on each end. She offered to let Billy feel the weight and laughed at his amazement of how much she could carry. 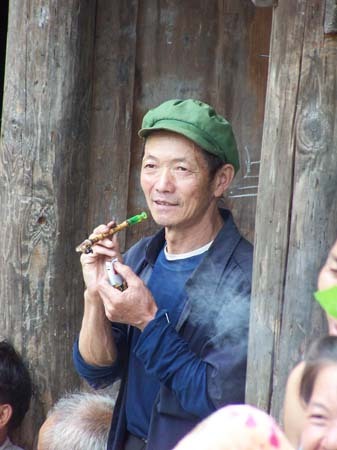 A man watching the foreigners while enjoying his smoke. Many men in China smoke. 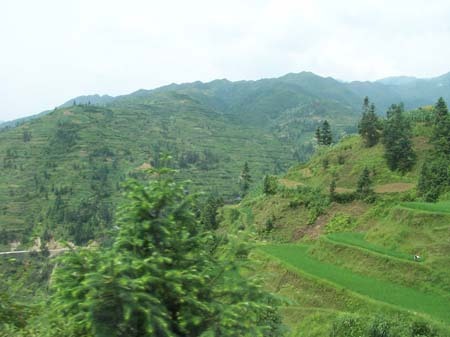 Beautiful green countryside with vegetables and tea growing all over the hillsides.